The raccoon lives in wooded areas near water. It is very adaptable though and is also found in suburbs and cities. It usually makes its den in a tree, but it may make its home in an abandoned woodchuck burrow, a cave, barn, sewer, or even a house. 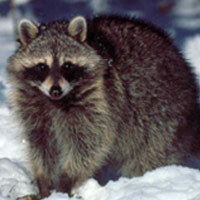 The two illnesses most commonly associated with raccoons are distemper and rabies. Rabies, unfortunately, occurs in the eastern U.S., having spread as far west as eastern Missouri. Rabid raccoons are probably not as common as the media reports would have us believe. Distemper occurs throughout the entire range and is highly contagious. Both are fatal. Symptoms of both diseases are similar and include difficulty walking, apparent confusion, and stoicism. Raccoons are not technically nocturnal but if you see one during the day, especially in or near a populated area, there may be cause for concern. Do not attempt to make a diagnosis yourself. Call a wildlife rehab professional if you suspect rabies or distemper. Wildlife rehab centers are listed in the yellow pages under 'Animal Rescue Services'. Do NOT call animal control.